Imagine a world where you have the most ideal job for you. In this world you have access to incredible health care, especially in regards to your mental well-being. This is a world where everyone truly belongs, a utopia, if you will. Well… at least for most people. Sure, some folks fall through the cracks but society didn’t really need them any way. No big loss. Welcome to the world of Psycho-Pass. Psycho-Pass’ world is one where a vast majority of its inhabitants are literally leading an ideal life, at least for them. In this way it very much is a Utopia. However, there is a darker side to the world, one that isn’t really in the public view but that everyone is vaguely aware of; that would be where the Dystopia portion fits in. If the system deems you as imperfect for society you are, at best, placed in an isolation facility, and at worst, brutally executed. All of this is done at the discretion of Psycho-Pass’ Sibyl System, a complex network that reads character’s, “Psycho-Pass” to determine there overall mental stability and societal aptitude. The show refers to this as someone’s hue, which can become cloudy from stress or negative thoughts/experiences. Usually this can be corrected with some medication or light therapy, but this isn’t always the case. Thus, people in this world are monitored closely. The system can determine if people are likely to commit crimes, à la Minority Report, and are then labeled latent criminals to be taken care of. Everything runs like a well oiled machine with (most) things in their place. On paper this is a world that is highly appealing. You go through your younger years as normal, take a test, and then the system lays out your life for you. Some may argue that this system would strip away your will and make life rather dull but Psycho-Pass repeatedly demonstrates the contrary. Most people are slotted into jobs that are ideal for them, there isn’t a lot of stress, and ultimately this affords its populace a higher standard of living with more freedom of choice when it comes to leisure time. There are even those that function outside of the system’s norms, much like today’s YouTubers. Despite the ill-fate that some criminals face under the Sybil System, some are brought on to work with the police force serving as consultants, technical support, and even actual enforcement. Generally speaking, there is a place for most people in the world of Psycho-Pass. All admit that for myself especially, there is a draw to this kind of world. I have a terrible time finding employment, fitting into societal norms, etc… Wouldn’t it be nice to have a clear path and lead a happy life? Although this line of thinking is contrary to many Western ideals, a lot of people would likely not be resistant to a promise like this. Especially if it worked. Now you may have realized I’ve skirted around some issues with this system. What happens when things don’t work, for the people who don’t fit into the system at all, what then? That’s what Psycho-Pass ultimately sets out to do while questioning if a system such as this is better or worse than what we have today. Everything I’ve discussed so far is brilliantly explained in the first episode of the series. While the episode isn’t perfect, it is a fairly excellent example of how to craft expectations for a narrative. With that said, let’s explore the first episode in detail to see exactly how it does that with minimal spoilers. When it comes to first episodes, a series should grab you and lay the groundwork for the story to come. You should have an idea about what the characters are about, the general way the world operates, and (hopefully) some kind of hook to get you to come back for more. None of this thinking here is really revolutionary, this is probably how you evaluate whether or not you continue with a series whether you consciously think about these things or not. Now not all shows do this well. Some series, anime or otherwise, take a few episodes to really get going but they really shouldn’t. This could be a whole discussion in and of itself, but the important thing to take away from this in regards to Psycho-Pass is that it checks all of these boxes. The series opens cold with its hook. Sweeping shots of the futuristic city, police on the move, as the catchy opening plays. You are then immediately thrust into a conflict between a battle-worn Kougami, seen in black, and the calm, collected, Makishima seen in white. In just a few seconds, the stage is already set for Psycho-Pass is going to be about: the conflict between Kougami and Makishima. The sharp contrast in their appearances, though brief thus far, communicate a lot about the characters already. At the very least, it should be obvious that these two will have clashing ideologies/worldviews if anything. Keep in mind, no dialog has even been said yet. After this quick introduction of the central conceit of the series, things are interrupted with a sudden burst of sound as Kougami fights one of Makishima’s lackeys. This scene does a few important things. It establishes that the gun Kougami has doesn’t seem to work until the helmet the random bad guy is wearing is broken while displaying Kougami’s general skill. However, it also demonstrates Makishima’s clear upper hand, emphasized by his positioning above Kougami on the staircase. The music then cuts abruptly and the pair are given a proper introduction via narration provided by the character we’ll soon be following, Akane Tsunemori. Her word choice places weight on how these characters were destined to clash, using lines like, “They were not two ships passing in the night” to describe their relationship. It’s only been two minutes and thirty seconds and the main idea of the story to come has been established. You know what to expect from the story moving forward, which leaves a lot of room for the first episode to establish the other characters and world. As you’ll soon see, dialog is a driving force for Psycho-Pass with only short bursts of action when conflict finally mounts. It’s here that we begin to follow our protagonist Akane on her first day as an inspector for the Criminal Investigation Department (CID). The first new character, aside from her, that you see is Ginoza. He has a serious, professional look, and is clearly a bit uptight as he irritatedly checks his watch. Psycho-Pass then delves into its world building while quickly introducing you to the other characters briefly. Outside of Masaoka, the grizzled ex-detective turned enforcer, you don’t get to spend much time with anyone else. Kougami is there, and clearly important, but he is downplayed for the sake of setting up future plot threads as he will clearly become a defining story feature as things move forward. This is important because this is told from Akane’s perspective. Established back from the opening narration with the confrontation between Kougami and Makishima, hinting that their relationship will become closer over time. It is a subtle detail to pick up on just in episode one, but an excellent example of great storytelling. In this scene where Akane is debriefed about the situation she is assisting with you learn about hues, crime coefficients, and the Sibyl System. Despite all of this terminology being tossed around, the situation is familiar. While anime rarely tackles crime dramas, in the West they are quite prevalent. Clearly this is a high-stakes situation and not a rookie job, further emphasized by Ginoza’s opening line to Akane. While all this is going on Ginoza tells Akane not to think of the enforcers as human beings. However, she regularly treats them as people worthy of respect. Ginoza also has particular animosity towards Masaoka, which sets up future plot points.Though, this won’t be explored much until the next episode. This dehumanizing of latent criminals is a fascinating aspect of the society Psycho-Pass has. As the Sybil System is explained, the idea of the technology is equally interested. If you weren’t interested already by the promise of a future conflict, then this exploration of ideas is sure to be a good hook. Additionally, it establishes that this series will be tackling deeper ideas that delve into a philosophical nature, which is a key aspect to the themes and ideas that the show presents. Now, admitably, not everything in these opening moments are good. Akane should know how the Dominators work but the show spends time having it explained to her through Masaoka for the audience’s sake. While in many other shows this would definitely be a lazy shortcut, at least this is in the guise of Masaoka passing wisdom down to Akane since field experience is different than studies. Everything I’ve described thus far happens within the first ten minutes. Even as the episode moves forward, having more exposition scenes with Masaoka and Akane, the pacing is always held at a nice clip. Transitioning from this we are introduced to the criminal they aim to apprehend this episode. He discusses how the system has always had him walking on eggshells but after just one misstep, his life is over. That’s what it means to become a criminal in this world. An ideal system for the masses but a persecutory one for the individual. His actions are important, as we’ll learn by the end of the episode regarding the woman he has hostage. A lot of this next bit is showing how Akane is somewhat lacking in experience. Reestablishing how the Domintor works, things like that. Mostly, this is a tension building moment as they hunt the criminal that you’d see in most crime dramas with some minor world building. There is one stellar shot in this sequence where Akane confirms that Masaoka is a latent criminal with the Dominator stating, “He doesn’t act like one, but he really is a latent criminal. He seems just like a normal person.” coupled with an overhead shot with a clear dividing line from the steal beam and wires between the two of them. Capturing the criminal is a spectacle piece. It shows how the Dominator works while also being an example of how some of this world is style over substance. The fact that the gun explodes the guy into a could of blood is obviously over-the-top and would damage the psyche of anyone who witnesses it. This is where the woman comes into play. Masaoka mentions the crime coefficients can be contagious and that they can affect any one, even the team. This is a nice bit of foreshadowing that is snuck in their for the more astute viewers. For now, this is important for the woman mostly. After being, “rescued” the woman is quickly treated as a criminal by all except Akane. This leads to an escalation of the situation. Akane proclaims that not all situations should be solved with the Dominator and the Sybl System. The other characters state that the system should not be doubted, that it is absolute. This leads to Akane shooting Kougami (paralyzing him) in order to save the woman. Ultimately, Akane’s methods would have won out and are shown to be effective. This illustrates that Akane will be a driving force within the system for change that is clearly needed. That’s the first episode and it does a lot. By clearly establishing where the narrative is going, having characters solidly introduced, and providing several varying hooks, it isn’t surprising to see why this 2012 title garnered so much popularity. Future episodes go further to reinforce and flesh out the concepts shown here. The big question moving forward is exactly that. What of the people who operate outside the system, that can’t be judged by Sybil? That’s where everything eventually goes with Kougami and Makashima. Providing philosophical debate and the ethicacy of such a system. If anything that has been discussed so far sounds interesting to you, then Psycho-Pass is a show you’ll likely enjoy. Their is so much more that could be said about this anime but I seriously could not do it justice. I highly suggest exploring other blogs, YouTube, etc… for more great content regarding this series because there is a lot of it. Hopefully my cursory look into the series was enough to at least get you interested in the series if you weren’t already. As for the rest of the Psycho-Pass series, there is a second season and a film currently available. There are some more films coming just around the corner however. The second season is a weaker version of the first, still providing a few unique ideas but mainly staying the status quo. Film wise, it isn’t terribly exciting but it provided some nice character moments for Akane and Kougami which many fans were clamoring for after the conclusion of this season. I’ll leave you with the trailer for the series here and leave you for now. Psycho-Pass is one of those shows that warrants more discussion so perhaps I will need to write more articles exploring the aspects of the show I didn’t get into here. I can’t stress enough just how much content there is stuffed into this series for discussion. You could easily write a novel exploring the ideas here if you wanted to. 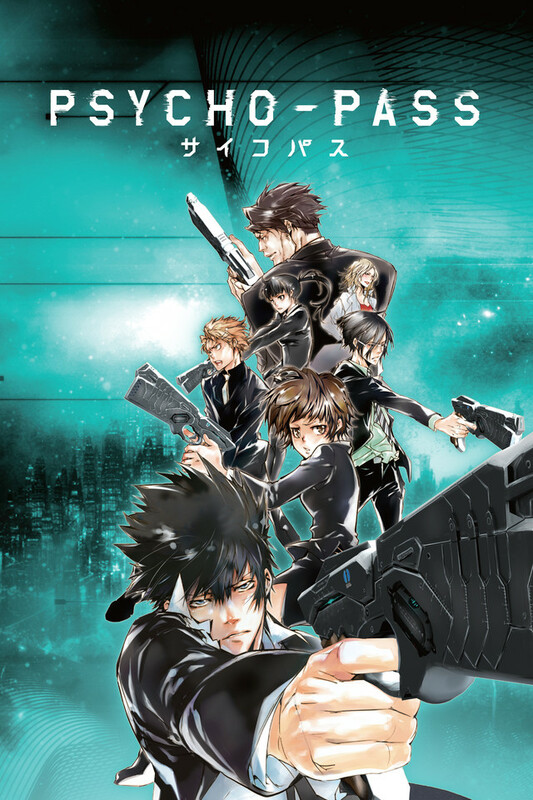 What are your thoughts on Psycho-Pass if you’ve seen it? If not, was I able to convince you to at least give it a shot? Let me hear your voice in the comments below. If you would like to support my endeavors in this series or otherwise please hit my donation button below. I’d greatly appreciate that. As always, thank you so much for reading and I’ll look forward to seeing you back here at Jon Spencer Reviews again soon! Nice post. I didn’t “get” the show on first watch but when I watched it again in one go it worked much better and told a great, if chilling story. Thank you! Yeah, this is a great bulk watch over a few sessions. Totally agree. …oh my gosh, thanks for pointing that out. I’ll fix that ASAP! I’m glad to hear that my efforts were worth the wait! 🙂 I will probably revisit this series in the future but right now I have more than enough on my plate. You might have seen I’m doing a Game Jam, that thing is a LOT of work! I really loved Psycho Pass. It asks some fairly solid questions and has some great character work. It isn’t exactly subtle, but it doesn’t really need to be. Everything about it just works in the end and it is a really fun viewing experience. Thanks for sharing your thoughts on it.